Firma Melodiya presents an anniversary set dedicated to Vladimir Spivakov’s 70th birthday. This outstanding musician is well-known and loved across the world. A violinist, educator, conductor, founder and permanent leader of the chamber orchestra Moscow Virtuosi and the National Symphony Orchestra of Russia, an organizer of the charity trust that supports talented children, a director of international music festivals both in Russia and overseas, a jury member of a number of violin competitions, and the president of the Moscow International House of Music - Maestro Spivakov’s artistic and social activities only broaden through the years. He performs all over the world, renews his violin and conducting repertoire playing with some of the best soloists and conductors. 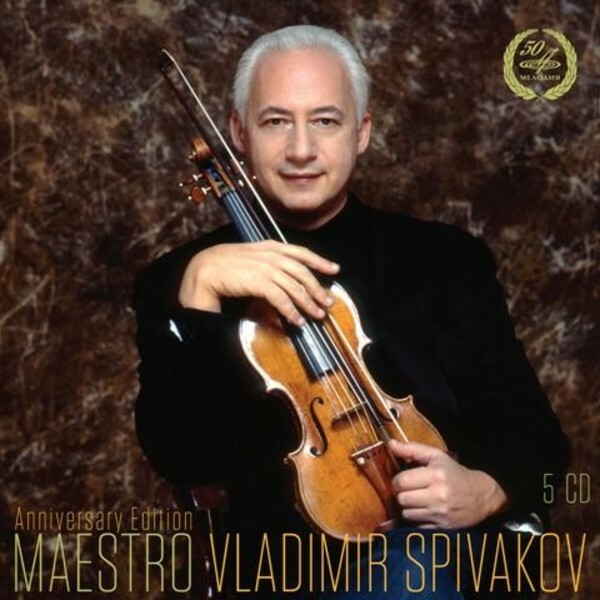 The 5-CD set features Vladimir Spivakov as both a violinist and conductor on recordings made in the 1970s to the 1990s. That period of performing activity and creation of the Moscow Virtuosi was a bright phase in the maestro’s career, leaving an unforgettable trace in performing arts of this country and the world. The chamber pieces by Schubert, Locatelli, Franck, Debussy, Ravel, Milhaud, Bartók and Prokofiev, and virtuosic numbers by Paganini, Wieniawski and Saint-Saëns, were recorded with remarkable pianists such as Viktoria Postnikova and Boris Bekhterev; one of the CDs is dedicated to Mozart (Symphony No.28 and the Coronation Mass) while another is dedicated to Rodion Shchedrin (Carmen Suite and also Music for the Town of Köthen written especially for Spivakov). Spivakov’s earlier unreleased concert recordings at the 4th International Tchaikovsky Competition in 1970 are of particular interest. The violinist was awarded the second prize and a silver medal at the competition for his performance of Sibelius’s and Tchaikovsky’s violin concertos, and Tchaikovsky’s, Sarasate’s and Shchedrin’s pieces.